The most iconic high profile international triathlon event So-Sri Lanka IRONMAN 70.3 Colombo will be staged for the second consecutive year in Sri Lanka on February 24. The official licencee of the World Triathlon Corporation and owner of the IRONMAN global triathlon brand in Sri Lanka, ProAm Serendib will be conducted the event in collaboration with Sri Lanka Tourism Promotion Bureau. 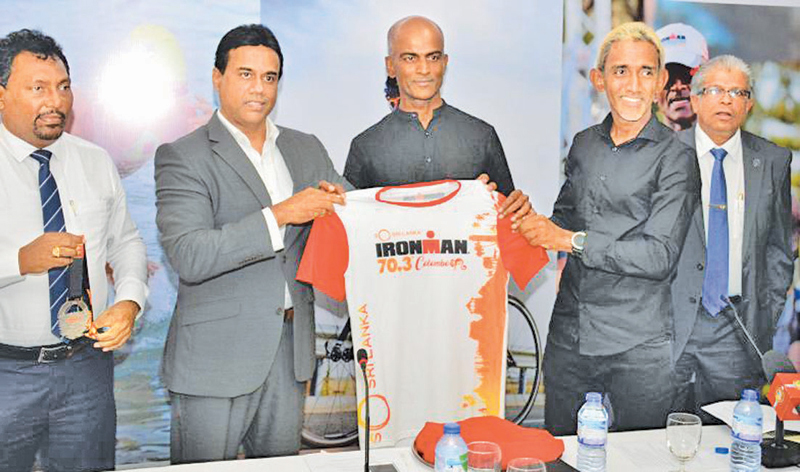 Following the success of the first edition of IRONMAN 70.3 Colombo which took place in the country last year which had managed to attract over 880 participants and around 2,300 friends and families from 60 countries with foreign exchange contribution close to USD 3 million, this year too the event will be staged on a grand scale. The top participating countries for So-Sri Lanka IRONMAN 70.3 are India, UK, Australia, France, USA and Japan. This challenging event will start at 6.00 am with a 1.9 km open water swim off Galle Face Green, followed by a 3-lap, flat, 90 km bike leg through the Colombo Port and an ending with a 21.1 km run passing through some of Colombo’s landmarks and finishing at Galle Face Green. Julie Moss, one of the IRONMAN greats will take part in the So-Sri Lanka IRONMAN 70.3 event with the objective of encouraging more women to get into the sport. A morning session titled ‘sip and share with Julie Moss’ will be held on February 21 at the Kingsbury Hotel. IRONKIDS Sri Lanka is all about inspiring kids to embrace an active lifestyle from a young age and to make them part of the big IRONMAN 70.3 event will be held on February 23 from 8.00 am onwards at the Galle Face Green. The event is open to all children aged 3 to 14 years and parents/caregivers are able to accompany their child. The event will feature four distances to cater for all ages and abilities. 3 to 5 years (500m) - Compulsory to run with one parent, 6 to 8 years (1km) - Optional to run with one parent, 9 to 11 years (1.5km) - Parents not allowed to run with kids and 12 to 14 years (2km) – Parents not allowed to run with kids. The IRONMAN 70.3, which is also dubbed as Half IRONMAN, is part of a series of long distance triathlon races held globally, which was initiated by the World Triathlon Corporation (WTC). The “70.3” in this segment denotes the total distance (113.0 km) covered in the race and consists of a 1.2-mile (1.9 km) swim, a 56-mile (90 km) bike ride, and a 13.1-mile (21.1 km) run. So, each of these distances, comprising the swim, bike, and run segments is half the distance of that segment in an IRONMAN triathlon. The Pro-Am Serendib has geared up to hold this prestigious international sporting event in Sri Lanka which happens to be the only IRONMAN event in the South Asian region. It provides the opportunity to build local capability and capacity to host international multi-sport endurance sporting events in Sri Lanka. Shangri-La Colombo, MAS, SriLankan Airlines, Ceylinco, MTV/MBC Group, Hayleys Tours, Advantis, Asiri, Adidas, Wijeya Group, SIS, Kantra LMRB, Emerging Media, Rotaract, Gravity, Bernard’s, Rainbow, Spinners and 230i will be the supporting partners.